Continue to use your existing email account as before. It really doesn't matter whether it is a free email account like Gmail, Yahoo, MSN or email account with your own domain name extension. Subscribe to CryptnSend service for your existing email address. Browse https://cryptnsend.com, compose a secure message, and send. Encrypted email message is sent to the recipient. Optionally select validation feature to validate a new recipient. Login with your email id and password. Go to settings to add signature line and other credentials. Encrypted and HIPAA compliant message is sent to the recipient with a copy to your Inbox. Use this account to send HIPAA compliant messages. Use your regular account to send plain messages and to receive all messages. Messages sent using any of the above will be saved to "Sent" folder in Webmail. Message is delivered to MDVault once message is sent. 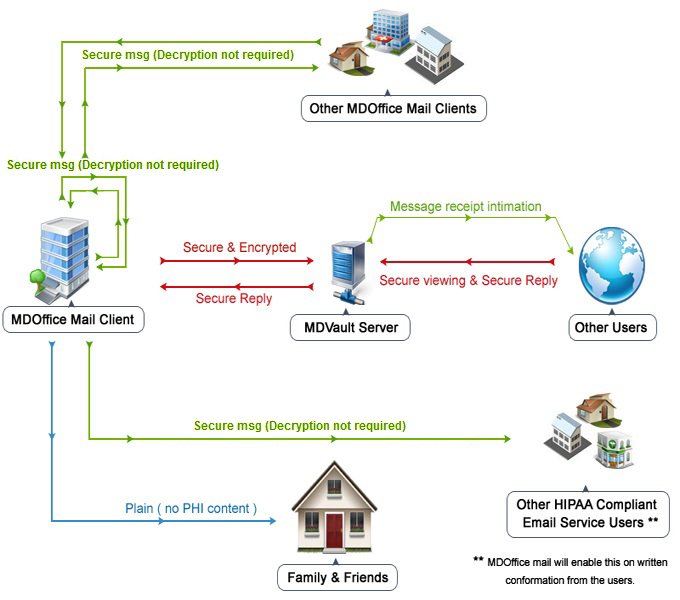 MDVault encrypts the message and holds it in secure server without delivering to the recipient. A notification is sent to the recipient informing that a secure, encrypted email message has been received. By clicking the secure web-link in the notification the recipient can log into MDVault Secure Server to decrypt, view the message and download attachments if any. Legal Archival. All the messages sent using CryptnSend are stored in a secure, remote server as soon as they are sent. These messages can not be edited or deleted. However they can be viewed and downloaded. New recipient validation: By selecting this option while composing a message sender can restrict a new recipient from viewing the message without a security token. This token can be conveyed to the recipient over phone. Password reset authorization: Unless the sender authorizes, recipient cannot reset a forgotten password to view a secure message. Validation of recipient to reset password: Optionally, the sender can validate the recipient requesting for a reset of a forgotten password. Option to send encrypted or plain message. Download and Store locally: Recipient can save decrypted message to any local folder or email client folder. Is there a way for someone to send a secure message to me? Yes, recipient of a secure message from CryptnSend or MDofficeMail user is having facility to send a secure reply by clicking "Secure Reply" in the received message. Are attachments supported by CryptnSend? Yes, attachments are encrypted as well, and can be downloaded by the recipient. Recipients can include attachments in their secure reply. Are there any limitations with CryptnSend? MDVault uses industry-standard AES-256 encryption in CBC mode with MD5 hash. Many federal agencies and financial institutions around the globe use the same class of encryption to protect very sensitive data. AES-256 encryption is so secure that there are no publicly-known attacks that will recover anything useful from an AES-256 encrypted file in any remotely reasonable amount of time. MDVault helps to send HIPAA-compliant, encrypted messages to any recipient, for end-to-end protection.. Send encrypted messages from MS Outlook with ease by installing CryptnSend Add-in for MS Outlook. Send encrypted messages from smart phone by installing CryptnSend App for iPhone and Android.